The Virtual Sink: Scooby Doo! Where Are You? On our way to see Clash Of The Titans the other night, my friends and I got lost on the back roads near the movie theater. 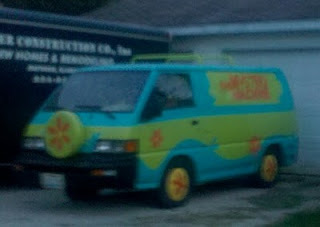 It was then that we happened upon a custom van made up to look like the Mystery Machine driven by the Scooby Doo gang. I've seen a few of these custom jobs over the years, mainly at car shows, but, before now, I've never seen one with the spare tire on the front, thus making it a closer representation of the original. how was Clash of the Titans anyway? i read reviews that the 3D effects were cheap and the storyline was lackluster. Class of the Titans sucked eggs. It looked pretty enough, but the story made zero sense and the characters were paper thin.